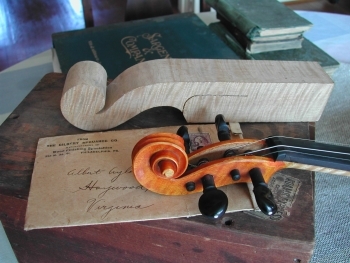 In his later life, Aylor became fascinated with violins, and he eventually made a total of 52 violins (as well as guitars and other musical instruments) for sale and for his children. His skilled instrument-making let him once again demonstrate his unique combination of art and mechanics. And his effort is nowhere better shown than in the jigsaw he made for his own use to help him create his violins. As much fine cabinetry as precise tool, Aylor's unique jigsaw expresses his striving for artistry and usefulness. 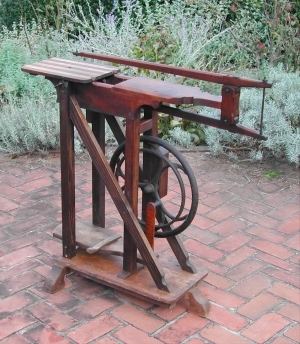 Albert Aylor's custom made foot-treadled jigsaw incorporates parts from an old sewing machine. Note the curly maple pedal drive rod. 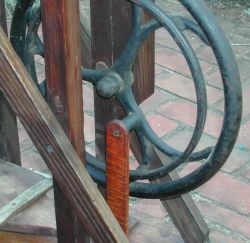 Aylor's jigsaw was far more than just another utilitarian tool. 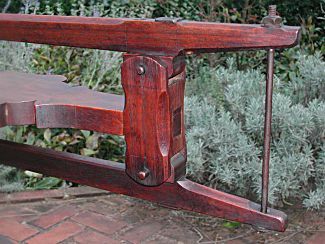 Notice Aylor's use of traditional cabinetry details (reliefs, pegged construction, complex patterns) along with his signature "scribe lines" on the fulcrum assembly.